from 3 pcs. 3.55 CHF ea. from 10 pcs. 3.15 CHF ea. 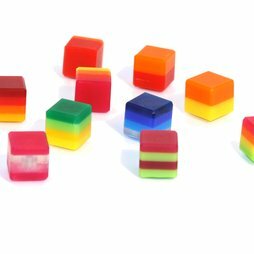 Attractive cubes made of acrylic glass with incorporated magnet. Each cube is made of several layers and comes in various colours. The colour combinations will vary with each order. The transparent types show the rod magnet on the inside of the cube. These magnets are made by hand and in small quantities in Switzerland. Sometimes there is a layer of transparent acrylic glass in the cube. In that case the rod magnet, which gives the cube its holding power of 1 Kilo, is visible in the middle of the cube. These cube magnets spread happiness and variety on the magnetic wall. With the colors of these magnets, it's similar to the Forrest Gump's box of chocolates: You never know what you're going to get! Please understand that we are not able to delivery the magnets in your specific choice of colors because the sets are packaged at random. The glued pieces are cut to size with a saw. Each side is sanded smooth. The hole for the magnet is drilled. The rod magnet is pressed inside.